The Christmas season is pantomime season – a time for two-dimensional villains, over-made up dames and the occasional panto horse. 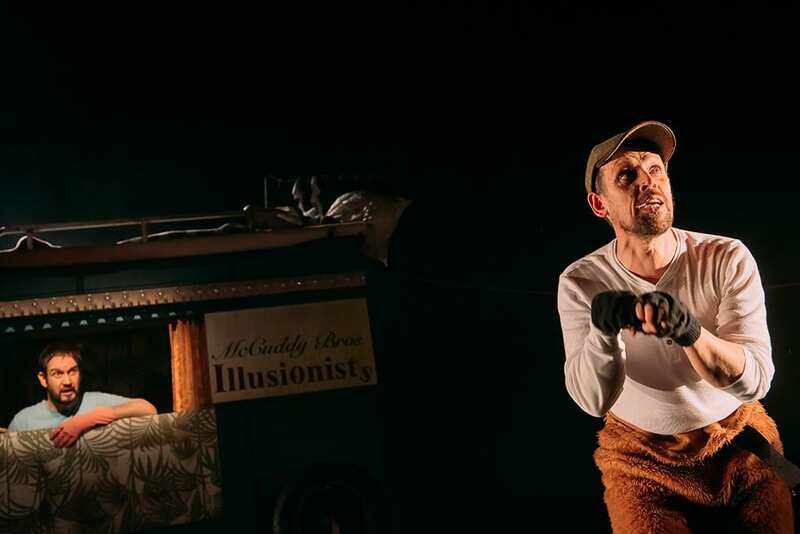 It is the latter of these that has inspired Andy Manley, Andy Cannon and Shona Keppe to create their version of the children’s classic, Black Beauty. 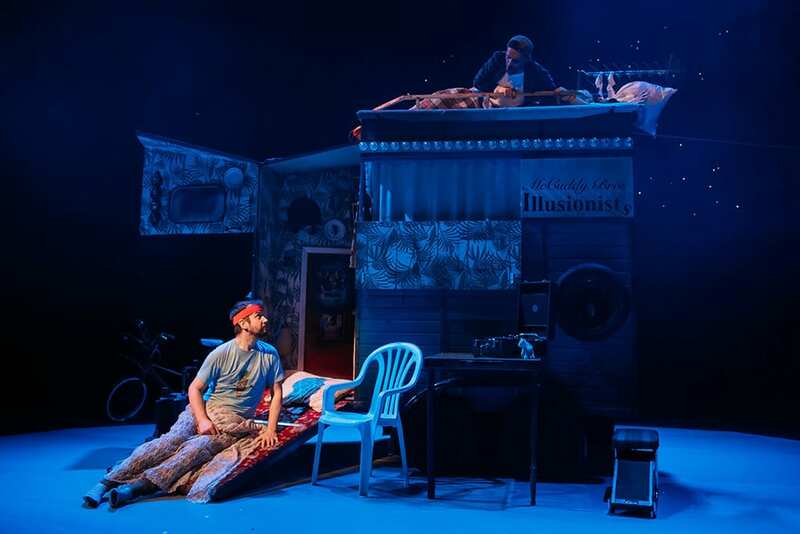 Their two-handed reimagining of the tale is based around brothers Andy and Andy McCuddy (Manley and Cannon), out of work pantomime horse actors who seek to take their minds off their straitened circumstances by telling themselves and their audience Black Beauty’s story. While on the most superficial level Black Beauty is a gentle children’s tale, the real interest of the book lies in its exploration of human attitudes to animals – good and bad. Much of the original novel’s power comes from the contrast of love and abuse its equine characters experience from their owners. This theatrical version neuters these complex elements in favour of a more basic Christmas story. Although there are no dames in sight, there is a fair bit of pantomime-style: ‘oh yes he did; oh no he didn’t’ and gentle slapstick. This reduces the story to two-dimensional levels and induces a short-changed feeling not helped by the short running time of the show. Only a few of the events of Black Beauty the novel are rushed through in Black Beauty the play, and most do not make it in at all. However, this play is not really about telling the whole original story. The creators set out to tell Black Beauty as simply as possible while framing it in a new, child-friendly tale of friendship in adversity. In this it is a success. Andy and Andy are a charming duo, playing off eachother to good effect. The slapstick routines are cute and well-choreographed (if occasionally a little over-long) and raise a good number of chuckles from the family audience. Equally well received are their occasional forays into the seats and interactions with the audience. The set and costumes are inventively used, quite apart from the expected well-executed pantomime horse. 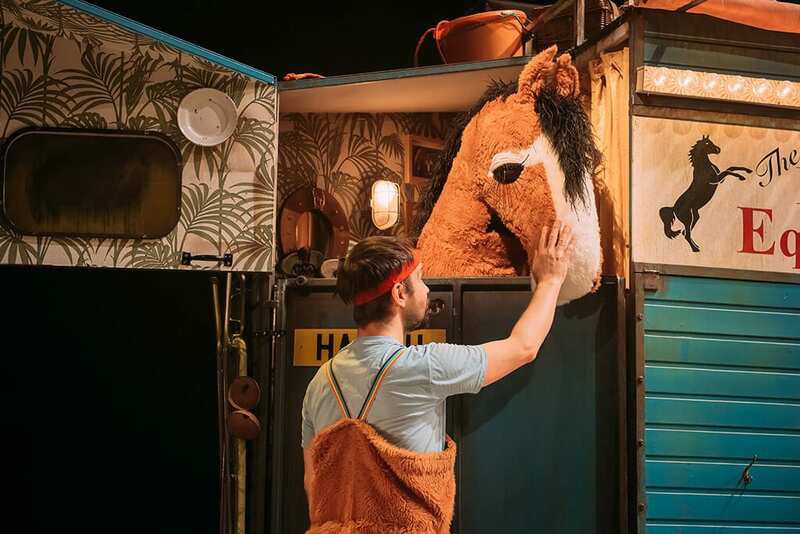 The horse box which forms the entirety of the stage dressing is made to work hard, serving successively as a stately home, carriage, burning stable, thumping party location and the home of the two Andys. Like the hats which the Andys use to inhabit various characters, this variety of location is convincing despite the fairly superficial physical changes. Also cleverly exploited are the handbags and wellington boots that make surprisingly good stand-ins for Black Beauty, his friend Ginger and Merrylegs the pony. It would have been nice to see these used and explored more, although the compressed nature of the play meant this was never likely. However, the resultant short running time will be appealing to parents with small children, as will the relatively long interval. Ultimately, appealing to families is what this production of Black Beauty sets out to do, and it achieves its aim. Anna Sewell probably did not have bum jokes and do-it-yourself udders in mind when she wrote the story, but this production is such a stripped-down version of the book that these excursions work in the world of the play. Fans of the original should not expect a comprehensive retelling of Black Beauty, but as a bit of Christmas family entertainment, this does the job well enough.